I know... Southern fixins (or is it fixuns) and vegan don't typically go together. The thing is, when my husband is having a busy week at work - I like to cheer him up with comfort food. When he comes in the door to a big meal of his favourites he has the face of a child on Christmas morning. This past Lent, our family chose to eliminate any food from animals from our diet - we ate like Adam and Eve in the Garden of Eden, which is... vegan. Although I wouldn't recommend making this all the time, vegan does NOT always equal healthy (example:Oreo cookies) these recipes are great for company, great for any holiday meal or potluck and especially great for cheering someone up! 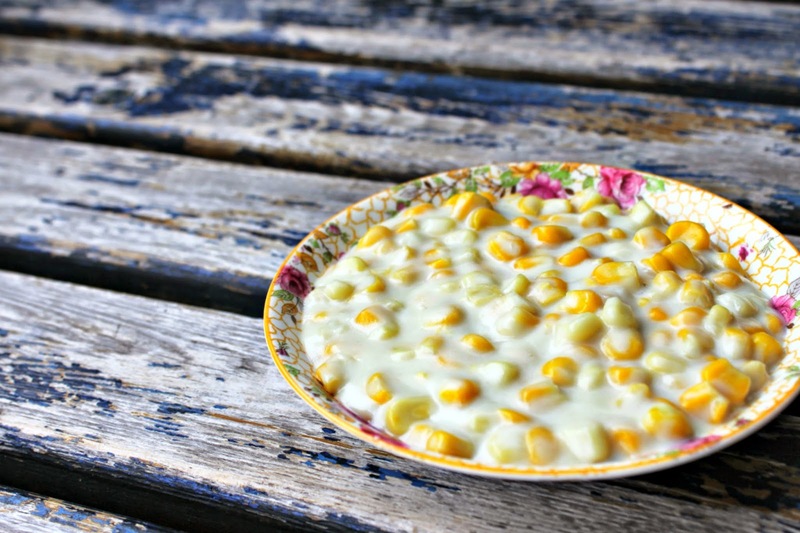 Place milk and sugar in saucepan, and add corn. Bring to a boil over medium high heat. Put flour in small dish and moisten with water until there are no lumps or dry flour. Once smooth, add flour and water mixture to the boiled corn and coconut milk. Keep the corn on high heat while the flour cooks and thickens the cream. I added salt and nutritional yeast, the nutritional yeast for a cheesy flavour (in regular creamed corn you add almost a full cup of parmesan). You can get creative here - adding a pinch of cayenne pepper, smoked paprika, or whatever strikes your fancy. As you may or may not know, I don't turn my stove on during the week. I especially don't turn it on to make one solitary thing. If I'm going to turn that baby on mid-week I have to have at least 3 things to put in there to make it worth while. If you turn your stove on feel free to make these in the oven - but I can't see why anyone would when they're so tasty and easy on the stove. Mix flour, baking powder and salt in a large bowl. Cut in shortening with two knives or pastry cutter until it is crumbly and there are no shortening clumps larger than a pea. SLOWLY add your milk, I added mine 1/4 cup at a time and didn't need all of the last 1/4. You need just enough liquid to hold the dough together and no more. Once you have a good consistency, knead dough on floured board very briefly (I'd say 3-5 times) and roll out with a rolling pin. I use a cup to cut out my biscuits, but you might be a fancy pants and have a biscuit or cookie cutter that will do the job. You can also just cut out a shape with a butter knife. Prepare your pan by turning it on high heat with a lid on. I used a heavy ceramic pan - it is best if you use something very heavy like cast iron, ceramic, etc. If you have to use a lighter teflon like pan turn the heat to medium high and wait longer for the pan to warm up so it doesn't smoke and get out of control. If you are unsure if your pan is hot enough drop a small amount of water on it. It should bead up, sizzle and evaporate in seconds. Add 1tsp coconut oil to pan, and roll it around so it's evenly coated. Add as many biscuits as will fit and put the lid back on, turning the heat to medium low (I'd say 6 on an electric). Allow biscuits to cook for 5-6 minutes and flip to other side for another 5-6 minutes. If you're unsure the biscuit is cooked thoroughly, just break one open and look for a nice flaky filling. If it's flaky, your'e done with the bakey. That was terrible, but it rhymed and I just couldn't help myself. Repeat as necessary with any additional biscuits, just remember to give the pan a break to heat up between batches. The BEST thing about frying these up was how little oil we had to use and how much flavour it added to the biscuits. We ate them "plain" with no butter (or Earth Balance), jam, or anything - they were just plain tasty. I love coleslaw. 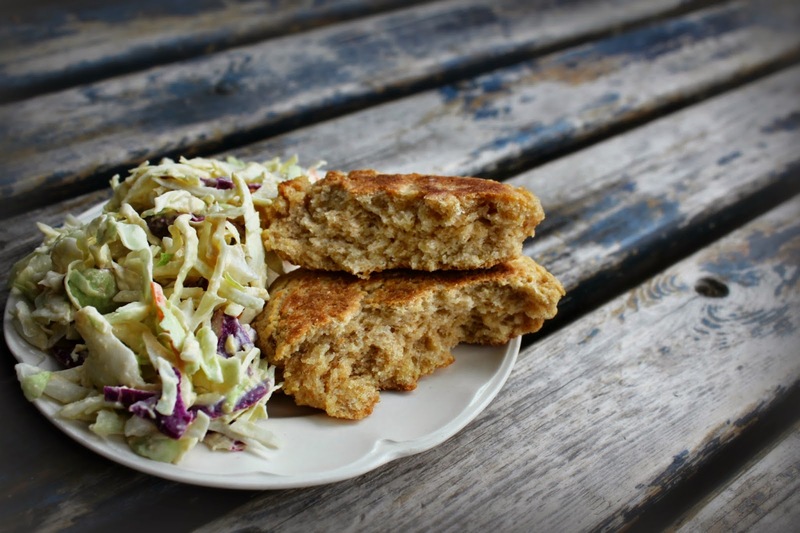 It's versatile, goes with a lot of different meals and the crunch just can't be beat. I love a good crunch. I knew I couldn't have biscuits and creamed corn without coleslaw. It's a food sacrilege. Coming up with something vegan was a breeze. I had been watering down hummus and basically putting in on EVERYTHING. Pizza. Veggies. You name it, I topped it with watered down hummus. Don't knock it until you try it, you might just start putting it on everything too! Now... don't judge me for buying prepackaged coleslaw. I was making homemade spring rolls and they are already a lot of work, so I skipped some of the HOURS of prep and bought the coleslaw mix from the fresh food section of the grocery store. It's just red and green cabbage and a few shreds of carrot. For $1.30/bag I was happy to skip prepping it myself. In a large bowl, mix your hummus and tahini until it is smooth and runny. Add the coleslaw, and the juice from half a lemon and you're in business. That's it. Seriously. Eat it. I hope you try some (or ALL) of these recipes the next time you're craving some soul food. Bon Appetite and Have fun with your Fixuns!